Our company offering high quality range of feldspar lumps. Our range of feldspar lumps are fabricated with high quality raw material & latest technology. Available in various specifications as per clients requirements. The offered range is widely appreciated for their reliability, purity and easy availability. : Potash and soda feldspar occur as essential constituents of granite, syenite and gneisses. However, workable deposits are found in pegmatite veins consisting mainly of feldspar, quartz-feldspar veins and also occur with mica pegmatites. Feldspar is of widespread occurrence and is mined in almost all countries. We have carved a niche amongst the most trusted names in this business, engaged in offering a comprehensive range of Potassium Feldspar Powder. We take pleasure in introducing ourselves as leading firm by offering Potassium Feldspar. Potassium Feldspar Lumps are used to manufacture color televisions on the cathode ray tube. 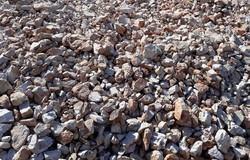 The Feldspar Lumps, that we provide, are known for their excellent quality. We are engaged in offering a qualitative grade Potassium Feldspar to our precious clients. In adherence to the set industry standards, the provided potassium feldspar is precisely processed using the latest processing techniques. This potassium feldspar is extensively used in preparing ceramics, glass and special electrodes. stack them accordingly in premium packaging. With the help of our brilliant logistics network, we render safe and time-bound deliveries. Being a leader in this industry, we are devoted towards providing a premium quality array of Potassium Feldspar Powder. Lumps & Powder available in fine mess or coarse forms. - For VITRIFIED TILES (double charge): L Value 78% plus & low B Value. Banking on our vast industrial experience in the industry, we offer an exceptional array of Potassium Feldspar Powder. They are free from added impurities and are used as basic chemical in different manufacturing firms. Our entire product range is easy to disperse and is delivered with air-tight packaging. Feldspar are naturally occurring minerals and are generally classified as either potash (potassium) or soda (sodium) feldspars based upon the predominant alkali metal element (the flux) that is present.